The first peak on the continental divide located 3.5 km WNW of Kicking Horse Pass. The S/SE slopes of the mountain are home to a huge avalanche chute which causes a threat to the Trans Canada Hwy in years of heavy snowfall. In 1971 the snow was so heavy that it was referred to as the "Year of the Hundred Year Avalanches" and it was the first time that explosives were used on the slopes of Bosworth. It was Peter Fuhrmann who was in charge of setting off the avalanche. 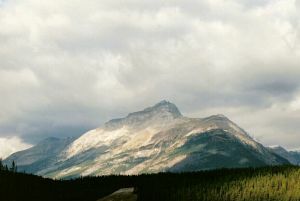 He was the Alpine specialist for Parks Canada at the time. So they bombed the slope and the following is from an article in the winter 2000-2001 issue of the Mountain Heritage Magazine: "The slide created a huge fracture line all the way across the mountain and [the slide] started to move very, very slowly. It was awe inspiring. Then the explosive charge went off and the slide started to pick up momentum. It was the only time I had ever seen a slide turn from white into complete black. The reason was that the slide was ripping out major timber and the soil with it. The timber and the soil were mixing with the snow to create a black cloud. Massive spears of timber were flying in all directions. When the slide hit the highway it took out everything. It went right across the highway, across Sink Lake and across the valley to the old 1A Highway. All the telecommunications to the west were wiped out and the impact was so great that it moved the bed of the railway." Name Notes: It was named in 1903 after George Bosworth who was one of the ubiquitous vice-presidents of the Canadian Pacific Railway. The CPR of the early 1900s seemed to have as many vice-presidents as this part of the Rockies needed names.